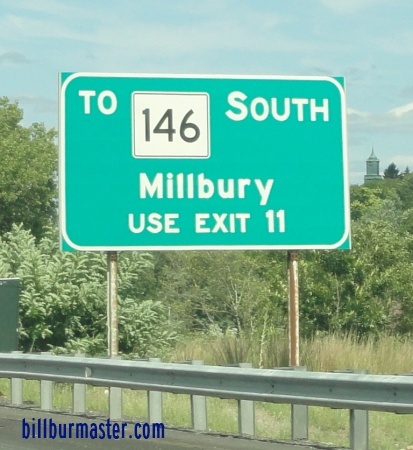 Massachusetts State Route 146 is a north-south highway in South-Central Massachusetts. 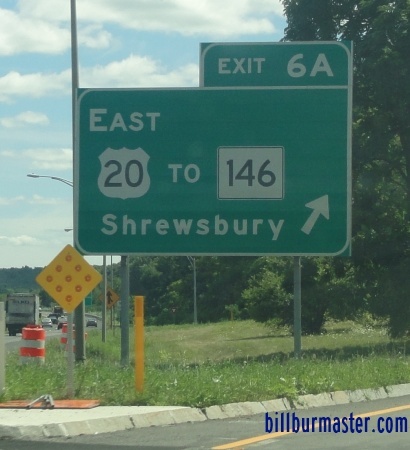 It runs from the Rhode Island/Massachusetts State Line, near Millville to Interstate 290, at Worcester. This is known as the Worcester-Providence Turnpike. Even though this is labled a "turnpike", it has never been a toll highway. MA St Rt 146 runs completly within Worcester County. MA St Rt 146 passes through the following town in Worcester County. MA St Rt 146 is multi-plexed in Worcester County. Massachusetts State Route 122A, near Worcester. 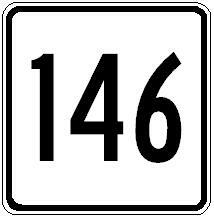 MA St Rt 146 crosses the following highways in Worcester County. Massachusetts State Route 146A, near Millville. Massachusetts State Route 16, near East Douglas. Interstate 90, (Massachusetts Turnpike) near Worcester. U.S. Rt. 20, near Worcester. Massachusetts State Route 122A, at Worcester. A set of BGS's in at ramp from EB I-90/MassPike.